It wasn’t hard to find smiles today. I would have to be evil to not laugh and enjoy a one year old’s first birthday party! I loved being around friends, watching my kids play with others, holding the sweetest and newest members of their family. I’m pretty darn sure the cutest kids around were all at that party today. Adorable! Regardless, I do get nervous about parties. Will my son handle the crowds well? Will someone say something that puts his mind into a funk? Will I have the right items in my bag of tricks to bring him back from it? And that’s just about my son. I also know that when it’s time to make our exit, my daughter will pull out all the stops to find a way to stay longer, whether it’s utilizing a tantrum or ultra sweet playfulness. So how did we fair today? We faired well. My son definitely started out in good spirits, engaging with our friends and enlightening them to ins and outs of a nine year old learning the trade at an auto body shop. But then a question was asked. A simple and innocent question. “Do you like to draw?” Well, that question led to my son remembering his light box that doesn’t worked. He’s tried to use that light box a few times with disappointment, but he has ended up putting his images against a glass door instead. Despite the fact that he solved his problem, the memory of the failing light still bothers him and I could see him beginning to become upset. I reminded him of the solution and gave him time to settle himself without bringing attention to it. I’m sure most people didn’t even notice him getting weepy, but I saw that he was headed down a slippery slope and I needed to find him some even ground. However, it wasn’t me that pulled him back up. It was the patient voice and even demeanor of a woman he’s met before, but barely knows. A woman, whom we affectionately call Nana despite not being our own grandmother, took the time to engage with him instead of choosing to sit with the adults. And how did it start? With another simple question. “Would like to play a game of bocce with me?” He instantly replied yes, with a brilliant smile that he shines so well. I watched as my son joined Nana in the barn to get the bocce set. I kept watch to make sure he wouldn’t be too overzealous with a ball. Then it was time for cake. 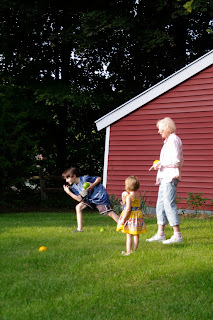 As my son and Nana approached for birthday pleasantries, Nana shared her thoughts on my son. She expressed in a tone that ensured honesty that he had quite the eye for bocce, that he had hit the little ball twice, and had a nice “bowling” swing. At hearing this, my son beamed with pride and happily made his way to the cake. She allowed him to see himself in a uplifted view. Like lifting a kaleidoscope to the light and seeing all the beauty within it after having it originally pointed into a dark crevice. Everyone at the party was kind to my son, talked with him, invited into the discussion and yet Nana changed his whole outlook on the day and on himself. You just never know what may trigger an emotional meltdown, even the ever so slight ones. Just when I thought my son would have a tough evening, Nana was able to pick him right up. And just by giving him a way to step aside from the crowd, enjoy a game, talk to him like he was an equal and then allowed him to hear her praise. I thanked her for taking the time to do all that and at that moment, the three of us were all smiles, his smile being brightening my life as though it were my own birthday. You made me cry - and smile. Love you and your family, Kelly. Your a good mom. What a beautiful blog. I cannot wait to read more of this. I have a son with ADD and understand. I always like to smile and laugh also. We've been to the brink with our family and I like to always smile and enjoy the good things. Thank you for the wonderful comments! And Julie, I feel that us moms have got to stick together!